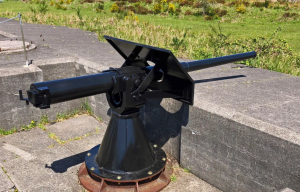 Fort Stevens State Park has acquired a fairly rare 3-inch Coast Artillery gun. 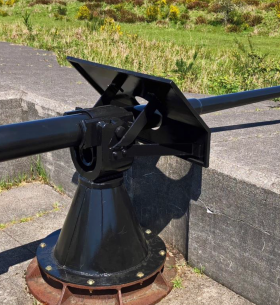 Fort Stevens State Park Ranger John Koch, in cooperation with the Oregon Parks and Recreation Department, worked out a trade for a gun barrel that the park had for the 3-inch one that was in possession of the Oregon Army National Guard museum at Camp Withycombe. Once on site, the Friends of Old Fort Stevens funded the recreation of a pedestal and shield for the piece. Friends director Steve Wicklander spearheaded the project. 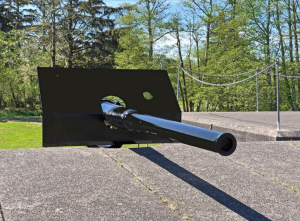 From measurements of actual 3-inch gun carriage parts across the river at Fort Columbia, the All Metals Fabrication company in Astoria, Oregon fabricated the necessary parts and assembled a realistic looking carriage and shield. On May 2, 2018 the gun and its carriage were delivered to Fort Stevens State Park. A heavy piece of equipment from Bergerson Construction company was waiting to lift it in place. The gun was emplaced at Battery Smur, a 3-inch gun battery designated to protect the Columbia River’s south channel submarine mine field. The battery having two guns, was in service from 1900 to 1920. It had a range of 12,000 yards. Back in the day, it was referred to as “The Little Battery.” If you have the opportunity, visit the park and check it out. It looks really cool. Many thanks to the local firms who helped to make it possible.